Mango – the sweet, fleshy fruit is native to India from where it spread all over the world. Summer & Spring is the time for Mangoes. Here is a recipe for a lovely Mango Milk Shake. The picture is an old one from my Collection. It doesn’t look great but you will love this refreshing Mango Shake. You need to use Ripe Mangoes for this recipe. Peel the mango and dice it into cubes. Blend the mango, milk, cardamom powder and sugar to get a smooth paste. Add the ice cubes and blend for another minute or two until thick & foamy. Feel free to add 1/2 to 1 cup of Vanilla Icecream to get a delicious Icecream Milk Shake. 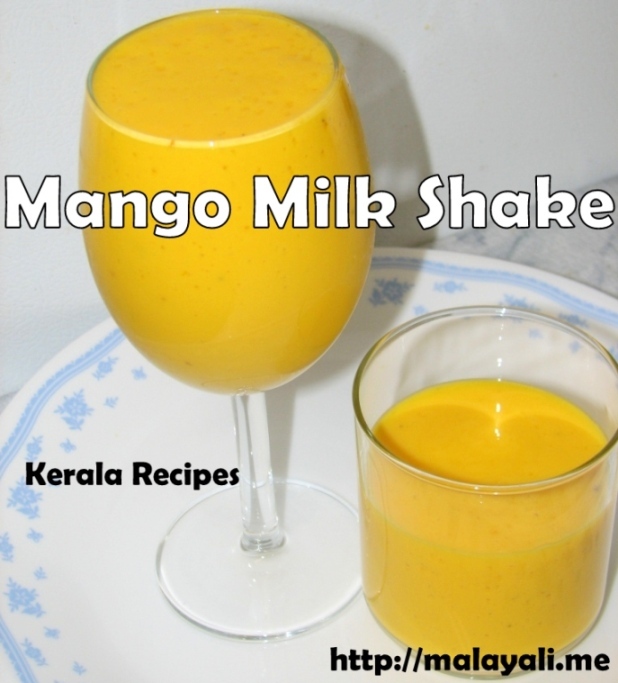 Try using Alphonso Mangoes for this milk shake as those are the best in terms of sweetness & flavor.